Selling The Vegetables From Your Garden? In recent years, many of the public are growing different types of food for consumption by supplying local farm stands, churches for distribution, and even some farm stores. Did you realize legislation has changed here in Texas about growing food for public consumption in 2018? 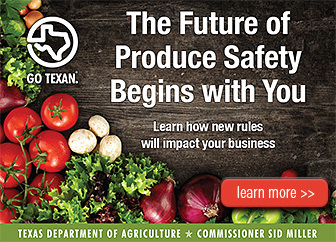 This year the Texas Department of Agriculture will be holding safety meetings statewide to help educate those of you growing food for public distribution whatever the location is. The recent press release given on April 9, 2018 comes ahead of spring planting, and harvest and has need of your feedback in the North Texas Area. While you may not feel that your small amount of produce grown in small quantities is of general concern, safety conditions are important for both the commercial and weekend suppliers here in Texas. It is the hope of the TDA to educate and help all who are interested in meeting all new Federal mandates delivered to the State of Texas. Click here to find out more. (AUSTIN) — The Texas Department of Agriculture (TDA) today announced it will hold a series of community meetings across the state to collect input on implementing the new federal law to promote the safety of fruits and vegetables grown across the country. The meetings will serve as a forum to gather public input as TDA develops the rules to administer this comprehensive new federal mandate. The Food Safety Modernization Act (FSMA), specifically the Produce Rule, establishes science-based minimum standards for the safe growing, harvesting, packing and holding of fruits and vegetables grown for human consumption. This is the first time such standards have been implemented. The purpose of FSMA is to shift food safety regulations from a system that focuses on responding to contamination to one that focuses on preventing contamination. FSMA was enacted on Jan. 4, 2011, and it authorizes the Food and Drug Administration (FDA) to take a preventive approach to food safety. TDA is the state agency responsible for implementing the corresponding produce safety program in Texas. In hosting the meetings in seven locations across the state, TDA wants to give producers an opportunity to discuss the development of the administrative rules as they pertain to farm verification, inspection and enforcement. Have You Tasted Your Water Recently?